Another performance yacht comes on the market as Peter Bennett at bluewater tells me he's signed the 33.2m sports motor yacht Crazy Too for sale. 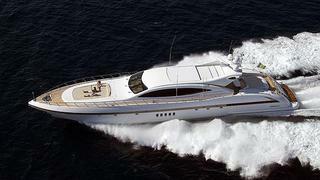 A Mangusta 108 built by Overmarine in 2005, her power is delivered by two MTU 2750hp M90 diesel engines, smoothly reaching top speeds of 36 knots. A light and contemporary interior designed by Guido de Groot is tailored using two tones; the upper deck features taupe and the lower deck bleached oak, resulting in smart contrast throughout. A four cabin layout with Pullman berths offers accommodation for up to 10 guests, whilst providing 2 crew cabins for a total of five crew. Lying in Golfe Juan, Crazy Too is asking €4.95 million.